Students Angelina Jefary, Rozanne Jeyanti Rajendran, Moses Mc Govern Philip Johnson, Prince De Mcqueen Wheatley and Muhd Fahman Fitri Mohd Mohtar from SMK Siburan, Sarawak won themselves full scholarships to pursue further study in any one of the Pre-University programmes at Sunway College or the Sunway University American Degree Transfer Program. The members of Funky Fresh Masters of the Universe beat five other teams in the Grand Finals of Click! 4.0. Their project addresses a critical social issue in their community - the participation of youths in illegal drag racing where many often end up injured or killed. Their initiative provides a platform for youths to spend time productively through participation in singing, dancing and the performing arts with a series of concerts where they perform for their peers and members of the community. The project drew support not only from members of their community but the police department as well. 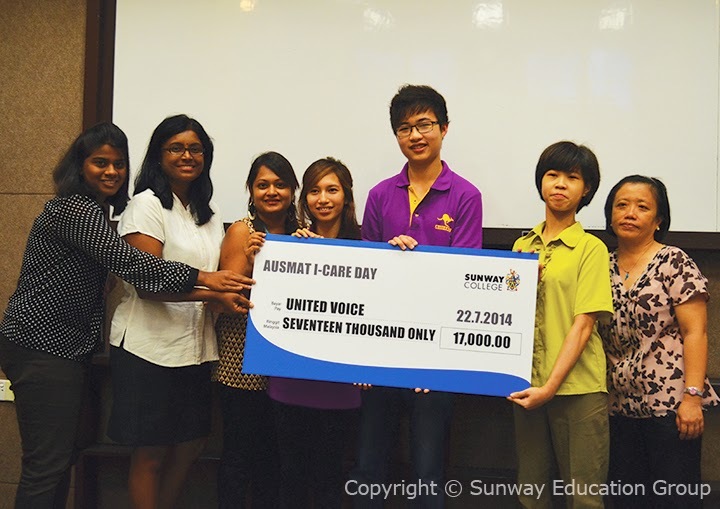 Students from the Australian Matriculation (AUSMAT) programme at Sunway College recently handed over a cheque of RM17,000 to United Voice. Representatives Yeong Moh Foong, Lead Coordinator; Lim Mei Chan, Committee Member and Janet Poh Chai Hoon of United Voice were on hand to receive the cheque from Vanitha Satchithanadan, Director of AUSMAT at Sunway College. This year, AUSMAT students and lecturers chose to channel funds raised from their annual I-Care Day to United Voice in a move to educate and raise social awareness amongst their peers on people with learning disabilities. Yeong Moh Foong, on behalf of United Voice expressed her heartfelt appreciation for the donation, thanking AUSMAT lecturers and students for their time and effort. At the recent Cambridge International Examinations (CIE) Outstanding Cambridge Learner Awards (OCLA) ceremony, 35 Sunway College Kuala Lumpur A-Level students were awarded certificates for their excellent performance in the June 2014 Cambridge examination series. The students’ impressive success this year saw 30 receiving Top in the World, 4 Top in Malaysia and 1 Best Across Three Cambridge International A Levels awards. 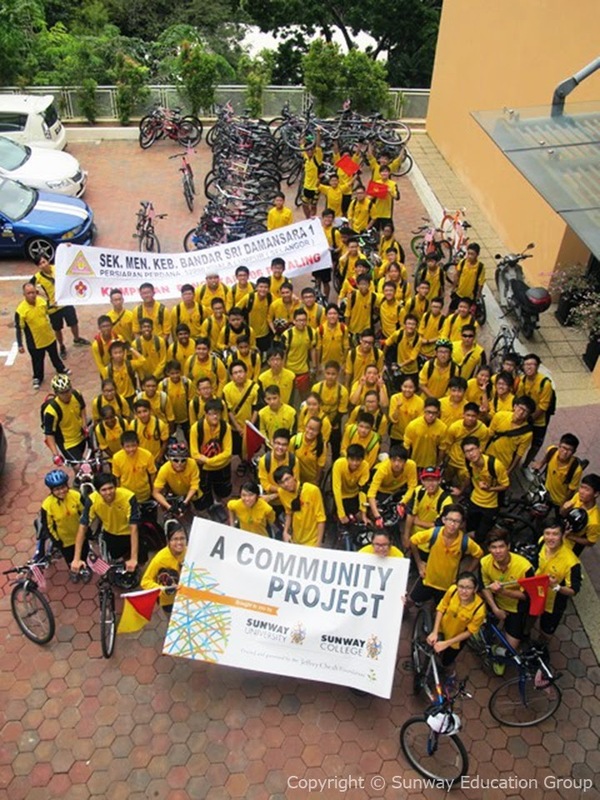 Never before had so many bicycles been seen at Sunway University. 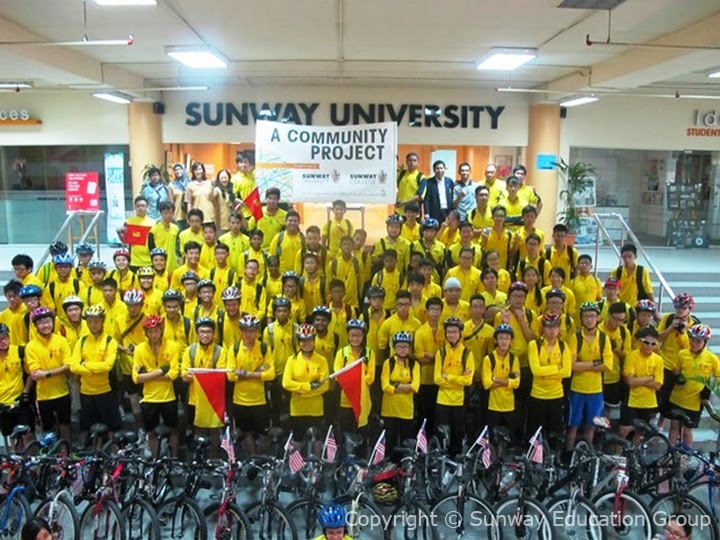 The University was the last stop for one hundred cyclists who took it to the streets of Selangor in an effort to promote healthy living and unity. Comprised mainly of students in the Scout group, they cycled from SMK Bandar Sri Damansara 1 to Bandar Sunway early one Saturday morning. Joining them were the alumni of SMK Bandar Sri Damansara 1 who are currently studying at Sunway College and Sunway University. Gaining admissions to the University of Oxford can be difficult, but not impossible. As the world becomes increasingly connected, information on applying to one of the world’s leading universities has become more accessible, not only via the internet but also face-to-face. The Oxford University Malaysia Club Outreach (OUMC), the official union of Malaysian students at the University of Oxford, brought their alma mater back home, allowing more prospective Malaysian students to learn tips and tricks into Oxford. 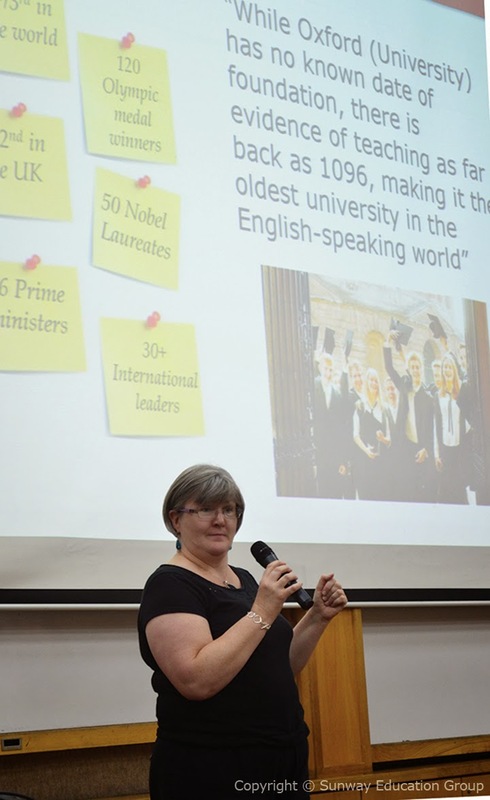 The recently held OUMC Outreach Seminar at Sunway College featured Dr Anne Mullen, Senior Tutor and Tutor for Admissions and Graduates, St Anne’s College, and a number of current Oxford students pursuing their studies in Biochemistry, Chemistry, Economics, Engineering, Law, Psychology, Philosophy, and Mathematics. They shared their experience of getting into Oxford including the assessment process and effective ways of responding to interview questions. BANDAR SUNWAY, 25 November 2014 - Chief Executive Officer of Education and Healthcare Division of the Sunway Group, Lee Weng Keng was conferred the degree of Doctor of Laws, honoris causa, by Monash University on 23 November 2014, at the Graduation Ceremony of the Monash University Malaysia held in Sunway Lagoon Resort Hotel and Spa, Bandar Sunway. 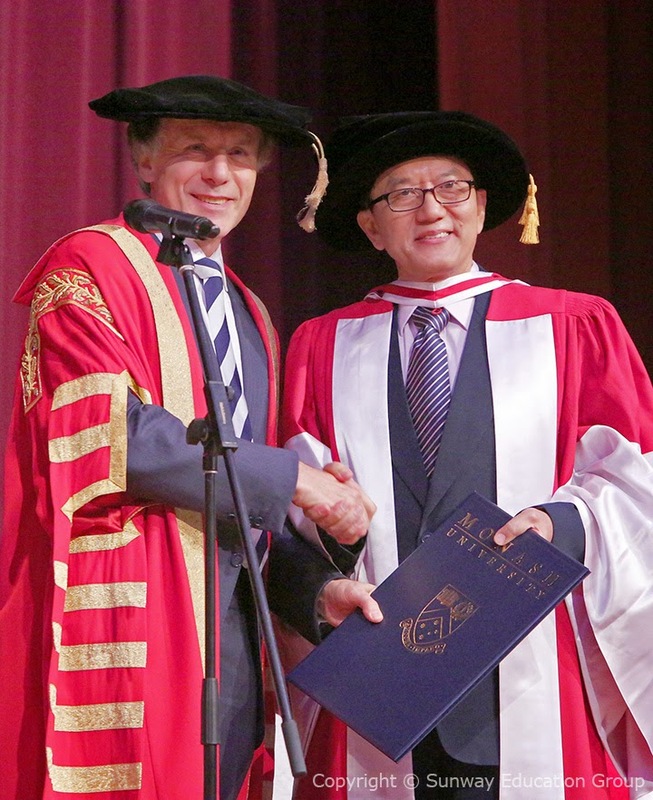 Monash University bestowed this mark of honour upon Dr Lee, who joins just a small group of distinguished individuals considered to be of conspicuous merit by the University to receive the highest award that the University can offer. The Jeffrey Cheah Foundation (JCF) doubles its scholarships awarded this year to over RM33 million, beating last year’s record of RM17.2 million. 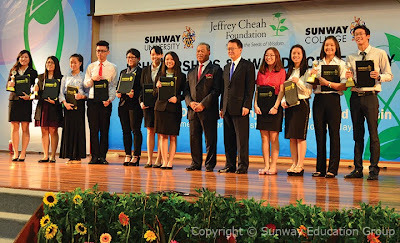 Deputy Prime Minister and Minister of Education, Tan Sri Muhyiddin Yassin presented the scholarships to the recipients together with Tan Sri Dr. Jeffrey Cheah, AO, Founding Trustee of the Jeffrey Cheah Foundation and Chancellor of Sunway University at the annual Jeffrey Cheah Foundation Scholarships and Awards Ceremony 2014 at Sunway University Hall. “Teaching is more than just a job or a profession, it is a calling. And I would say it is a very noble calling indeed. You are moulding the future of our nation, scientists, accountants, psychologists, doctors, lawyers, teachers and leaders, the list is endless. You bear great responsibility over our nation’s most precious asset and treasure, our youths”, said Dr Elizabeth Lee, Senioir Executive Director of Sunway University and the Sunway Education Group in addressing the academic staff of Sunway College and Sunway University at the recent Teaching Appreciation Day. Themed “Our Passion. The Future”, four awards were given out during the event, honouring teachers for their dedication and contributions towards the institutions. The first award handed out was the Award for Excellence in Teaching (AET) to Santhi Suppiah from the Australian Matriculation (AUSMAT) programme, Sunway College. Santhi who has been with Sunway College for 17 years, teaches mainly in AUSMAT and but does special teaching assignment for other programmes such as the Foundation in Arts (FIA), Monash University Foundation Year (MUFY) of Sunway College and the Psychology Department of Sunway University. 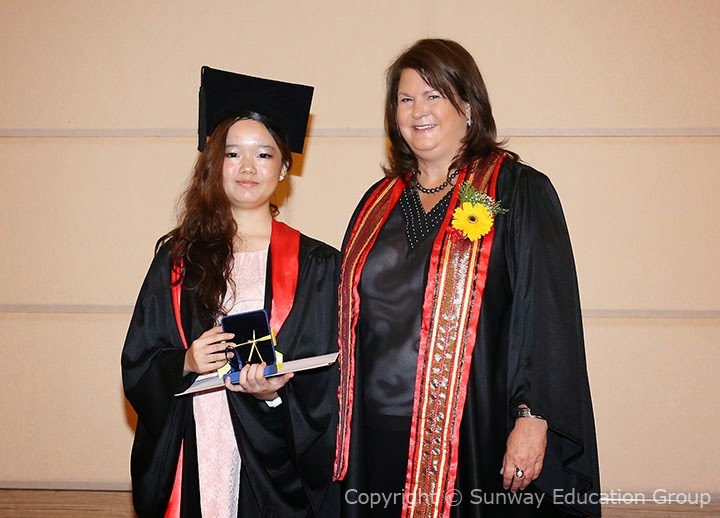 “If there’s a word I’d use to sum up my life, it would be ‘unpredictable’,” said Chloe Tee Tze Ling, valedictorian of the Sunway College Foundation in Arts (FIA) 13th Graduation Ceremony. Celebrating the graduation with other 142 graduates, Chloe said that FIA was one of the best choices she ever made even though the pre-university programme was not her first choice. She is grateful for the FIA experience as the lecturers, whom she referred to as teachers, were caring and encouraging in helping her and her fellow graduates build a solid foundation for their future undertakings. 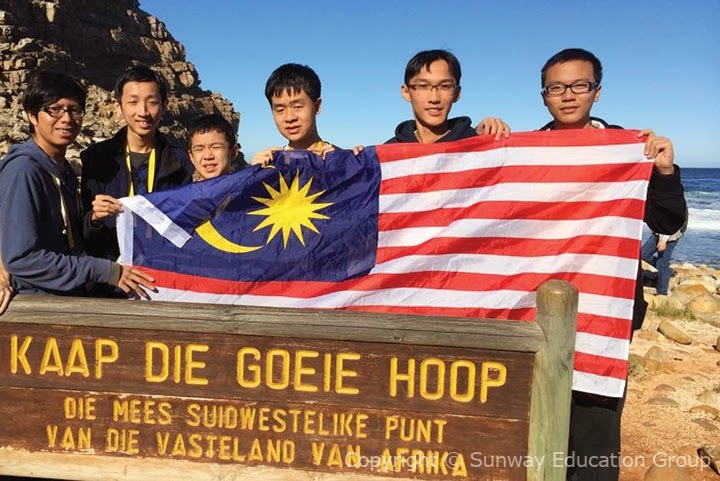 Two students from Sunway College recently returned home with gold and silver medals from the 10-day International Mathematical Olympiad (IMO) 2014 held in Cape Town, South Africa. A-Level students Anzo Teh Zhao Yang won the gold whilst Khong Yi Kye secured the silver. Collectively with three others, the Malaysia team ranked 23rd. It is Malaysia’s best international ranking ever attained since it first participated in 1995. Anzo together with another teammate contributed to the country’s second and third gold since the first IMO gold in 2011. The IMO, an extremely intensive and competitive mathematics competition, is one of the oldest, biggest and most prestigious of all the international science Olympiads. Participants are tested with questions ranging from precalculus to other mathematical branches not conventionally covered in schools or at university level, such as projective and complex geometry, functional equations and well-grounded number theory, of which extensive knowledge of theorems is required. 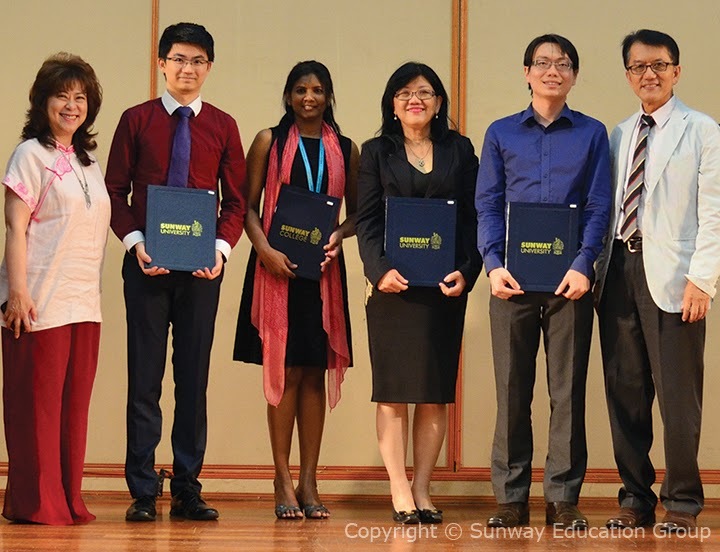 Sunway’s A-level top scorers and returning alumni from top universities gathered at a recently held A-level Tea Party by Sunway College celebrating the accomplishment of students in the June 2014 Cambridge examinations. Among those present were Henry Lee Min Rong, who scored 4 A*s in Further Mathematics, Mathematics, Physics and Chemistry. Articulate and cheerful, Henry is pleased to have been offered a place in Jesus College, University of Oxford to study Mechanical Engineering in October. “A-level was arguably the fast track to top universities. My experience at Sunway College has been truly challenging as it involves a lot of self-motivation and independent study in a university campus setting that is different from high school,” said Lee. Ten Australian Matriculation Programme (AUSMAT) students of Sunway College were recently awarded the prestigious Business, Economics and Law (BEL) Scholarship by the University of Adelaide. The students Goh Ching Ying, Chong Chun Seng, Santhya Ramalingam, Tan Shu Fang, Gillian Teo, Kimberly San, Lim Wei Wen, Ong Sze Rui, Chu Way Shen and Lee Chia Ying received the BEL Scholarship valued at A$8000. The Sunway Education Group and the Jeffrey Cheah Foundation (JCF) recently hosted the Harvard Asia Leadership Conference and Camp at Sunway University from August 17 – 22 in collaboration with the Centre for Asia Leadership Initiatives (CALI). Themed “Leadership and Innovation in the 21st Century, the event aimed at transforming young Malaysians into strategic global leaders to help change the country and the world through teaching and learning from facilitators with extensive experience from Harvard. 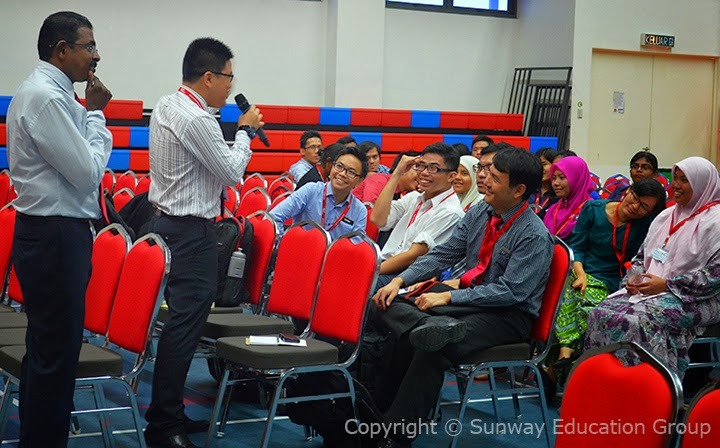 The event was the second to be organised by Sunway Education Group and CALI after a similar conference in January. Dr Elizabeth Lee, Senior Executive Director of Sunway Education Group revealed that the collaboration with CALI will continue with more projects. “With our continuous effort, the project will get better. We may have to tweak it, or perhaps narrow down the age gap in order to meet the needs and demands of Malaysia,” she added. Samuel Kim, President of CALI concurred with the plan of returning to Sunway with the Winter Trek in December 2014 or January 2015. 276 Canadian International Matriculation Programme (CIMP) graduates from Sunway College recently celebrated their pre-university study accomplishments. 33 graduated with an overall average result of 90 percent and above while 82 graduates graduated with an average result between 80 and 90 percent. Top student Christie Grace, who hails from Indonesia with an overall average of 97.50 percent, received two special awards for her outstanding achievement - The General’s Medal for Academic Achievement 2013-2014 from the High Commissioner of Canada, Her Excellency Judith St George and the Tan Sri Dato’ Seri Dr Jeffrey Cheah Scholastic Award from YBhg. Puan Sri Datin Seri Dr Susan Cheah. 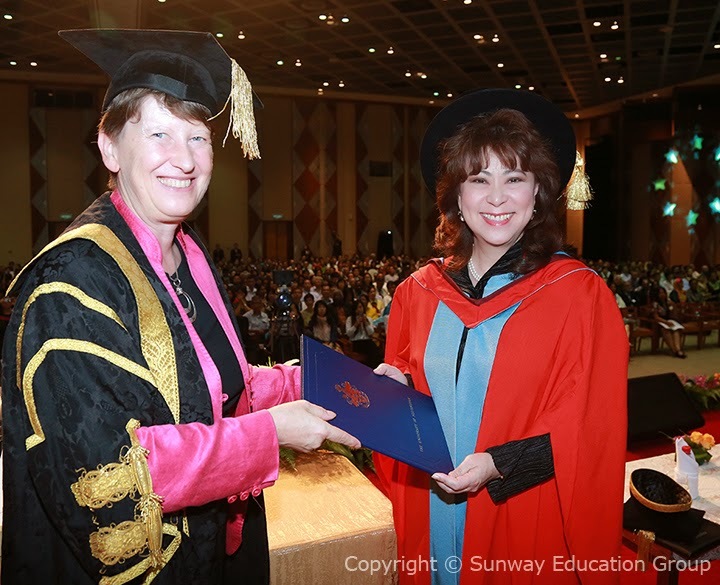 Senior Executive Director of Sunway Education Group, Elizabeth Lee Fuh Yen has been conferred an honorary doctorate by the Council and the Senate of University of Nottingham, United Kingdom, for her immense and exceptional contributions to education in Malaysia. She received the Doctor of Laws, honoris causa, from Professor Christine Ennew, Pro-Vice-Chancellor of The University of Nottingham, and Provost and CEO of The University of Nottingham Malaysia Campus, at the graduation ceremony held recently. Each year the world-class University of Nottingham, ranked in the top 1 per cent of all universities worldwide bestows honorary degrees to a small select number of individuals who have achieved outstanding success and distinction in their chosen fields. Dr Elizabeth Lee joins the creator of ibuprofen, the late Professor Steward Adams, OBE; British High Commissioner to Malaysia, H.E. Simon Featherstone, CMG; Olympic Gold Medalist, Dr Tim Brabants, MBE; and current governor of Bank Negara Malaysia, Tan Sri Dato’ Sri Dr. Zeti Akhtar Aziz; to be amongst the choice luminaries who have received the honour. "The teambuilding was so much fun and I want to do it again! The games taught me a lot about teamwork especially through the beach activities", says Ong Jo Lyn of the Sunway College A-Level programme. Jo Lyn was one of 52 Sunway Student Ambassadors from various pre-university programmes at Sunway College selected for a day out at Sunway Lagoon. 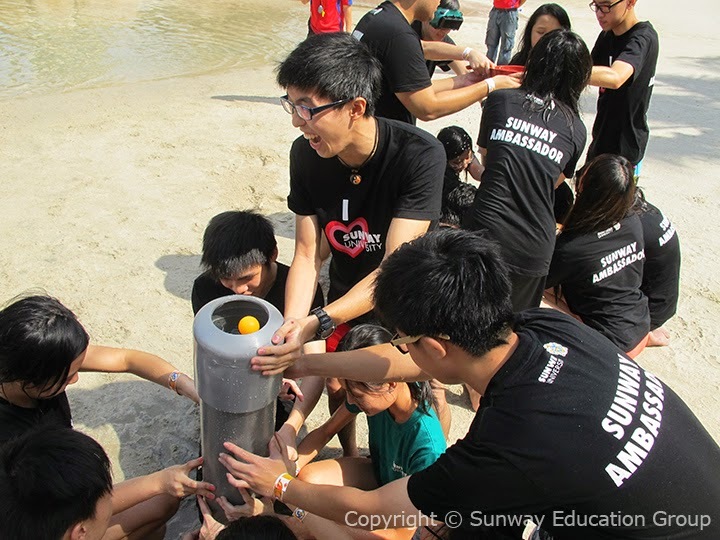 The special outing where the students were engaged in teambuilding exercises and games was held in appreciation of their outstanding achievement through active involvement as volunteers in events by the Sunway Marketing Department and as Sunway’s brand ambassadors. Students from the Victoria University Business Club (VUBC) at Sunway College Kuala Lumpur recently handed over a cheque totalling RM7,500 to Carolyn Chong, Associate Director, Student Mobility & Partnerships of Victoria University, Melbourne. The funds were raised by VUBC students through a 3-day Philanthropy Bazaar held in March 2014 for underprivileged students from lower or middle income families in Victoria University, Melbourne. “The most unforgettable memory was when all of us stayed up late to decorate the venue. VUBC members have placed their greatest efforts into this event,” said Ong Lee Yan, President of VUBC. “The ones in charge for the event were Phaik Wa, Vincent and NeeNa, who really coordinated the team well“, she added. Students from Sunway University and Sunway College with total of 54 medals stormed to victory at the MASISWA Sports Carnival - Selangor Zone and MASISWA swimming championship. The rush of gold medals by the university and college’s swimmers saw them retaining their title as swimming champions which they won in 2013. This is the first time Sunway University has emerged as the top performing university in the MASISWA Selangor Zone Sports Carnival, beating 16 other private learning institutions; and its second victory in the MASISWA swimming championship. In the MASISWA Selangor Zone Sports Carnival, the Sunway team took home 11 gold, 7 silver and 5 bronze medals. Bowling athletes contributed the most medals for Sunway University with Victoria Chin of American Degree Transfer Program (ADTP) and Cheah Yung Ren of Foundation in Arts (FIA) sharing 9 gold medals between them. Two of the gold medals came from table tennis player Wendy Lau Jun Zhen of BSc (Hons) Accounting and Finance. For the MASISWA Swimming Championship at Bukit Jalil National Aquatics Centre, Sunway University sent a 12-member team and all came back with a medal. 11 golds were bagged and two members of the team were crowned as top performers in the competition. Chan Jie of Certified Accounting Technician (CAT) and Mary Ann Kok of ADTP emerged best male and female swimmer. Sunway University’s athletes are now gearing up for on-going MASISWA and MAPCU (Malaysian Association of Private Colleges and University) sports competitions which are continuing until end of 2014. 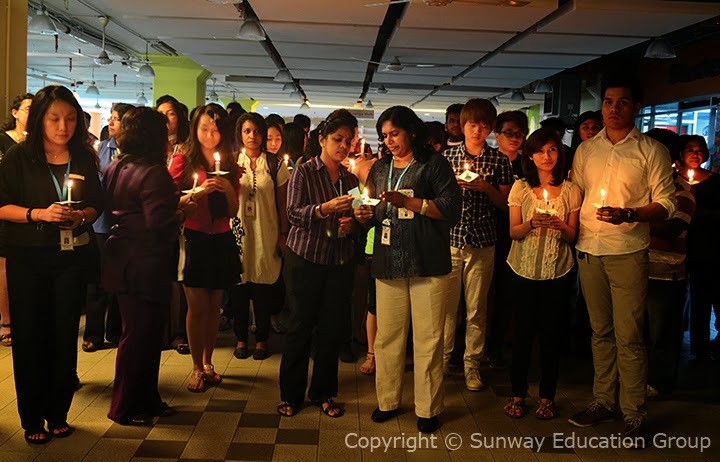 Students and employees of the Sunway Education Group gathered on Friday, 22 August for a moment of silence to honour the victims of the downed flight MH17. 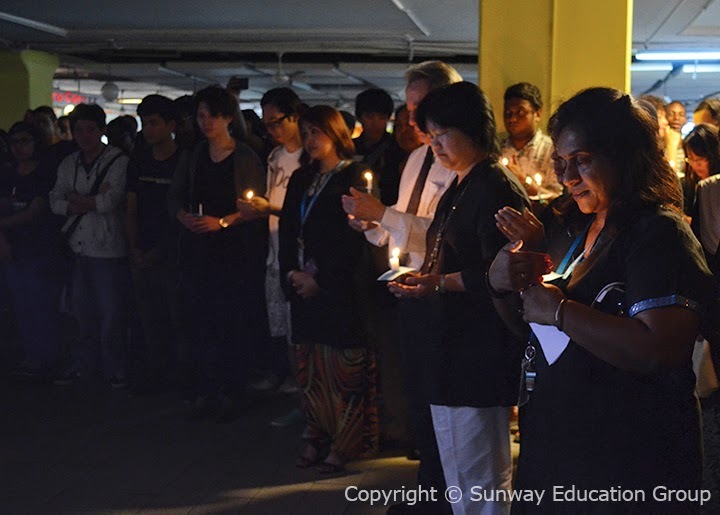 The National Day of Mourning was observed on campus with a candlelight vigil, organised by Jennifer Rathabai, President of the Sunway Academic Staff Association (SASA). 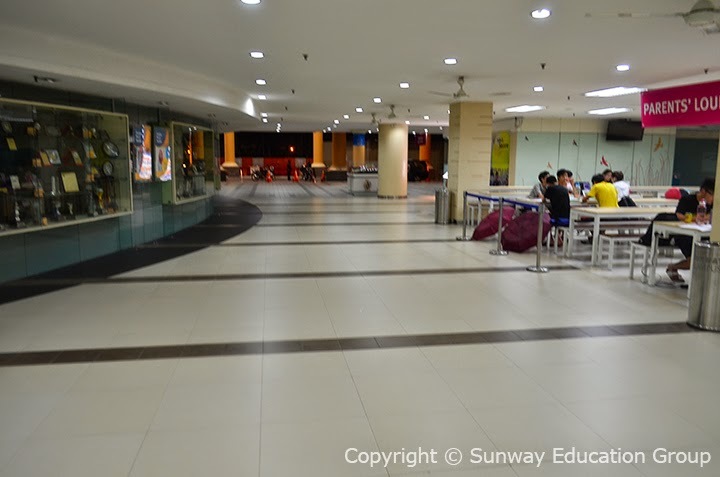 “At Sunway, we are not just focused on exams. We pride ourselves in providing an all-round experience for our students. Education is much more than a mechanistic process which achieves its highest state with the maximisation of academic performance. Exam success is necessary but not a sufficient condition for being an educated human being. As human beings, we are not machines but flesh and blood, with capacious minds, with bodies, with emotions, and with a soul. A focus merely on exams can all too easily lead to closed minds and leave the heart cold. A focus on character seeks to open their hearts and open their minds. The development of good character is important because good character strengths are a great predictor of success in university and in life,” said Elizabeth Lee, Senior Executive Director of Sunway Education Group. 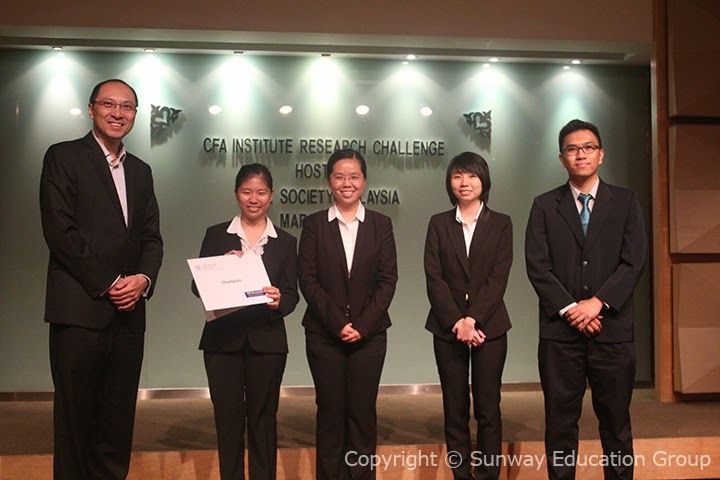 Cheah Mun Hong of SMJK Katholik, Petaling Jaya beat 95 others from secondary schools around Malaysia to emerge champion at the recent Sunway College Victoria University (VU) Business Challenge 2014. Cheah won himself a full scholarship which covers the tuition fee for the entire 3-year VU Bachelor of Business programme at Sunway College. Wong Weng Kit from Chong Hwa Independent High School Kuala Lumpur was 1st Runner-Up, with Yang Ya-Ting from Chinese High School, Batu Pahat, Johor 2nd Runner-Up, winning themselves scholarships worth RM24,000 and RM15,000 respectively for the VU Bachelor of Business programme. Wong also emerged winner in the individual category, Challenge Your Business Knowledge. Lee Kwan Yew from Chong Hua Middle School, Port Dickson and Tan Kok Yee from Chong Hua High School, Seremban both won a Consolation prize of RM2,000 bursary each for the programme. Winners of the group category were from Chong Hua High School, Seremban; Ang Su Ki, Tey Shiao Fun, Chee Kah Mun and Tan Kok Yee. 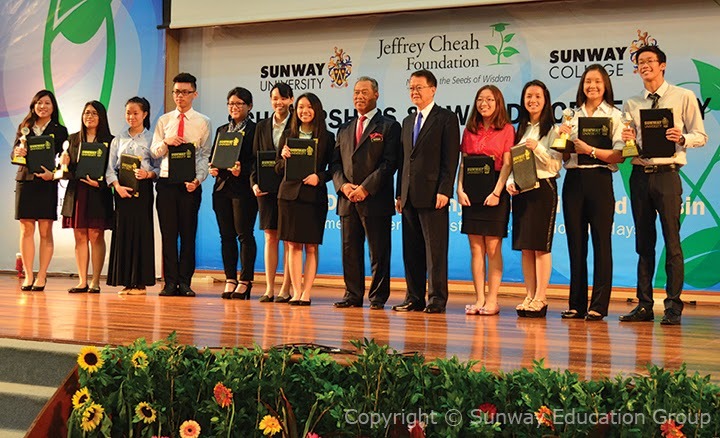 The Sunway Education Group welcomed a new batch of Jeffrey Cheah Foundation (JCF) Community Scholars at a recent gathering at Sunway University. The gathering of new, existing and graduated scholars was targeted to help the new community scholars in getting to know each other. It also provided an opportunity for the seniors to share and encourage the juniors in their educational journey at Sunway University. In her welcome speech, Elizabeth Lee, Senior Executive Director of Sunway Education Group, citing higher education as the hope for a better and brighter future said, “All of you here this morning will be our next generation of leaders. The future can be bright and success possible. Always remember, you have unlimited potential, we are just here to help you on your way”. 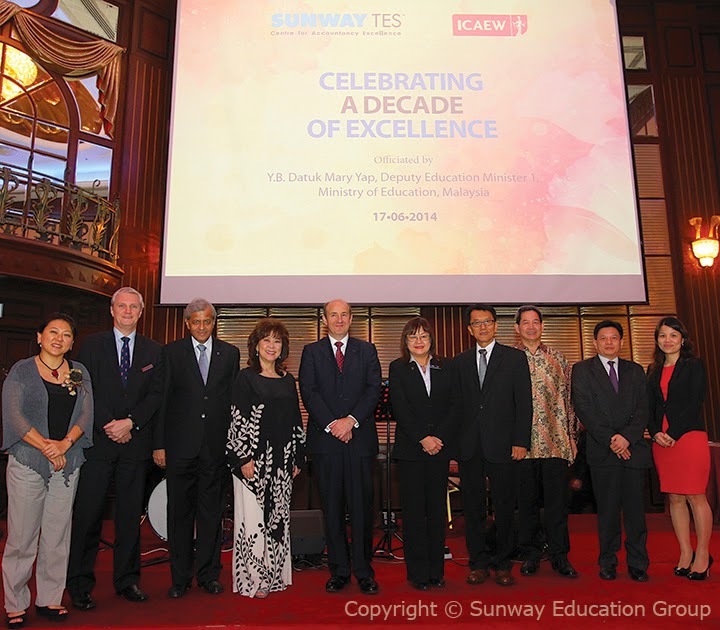 Malaysia’s leading accounting school, Sunway TES partnering with ICAEW (Institute of Chartered Accountants in England and Wales) launched the Sunway TES-ICAEW Excellence Scholarship for four public universities recently. The launch of the scholarships worth a total of RM1,199,200 was in conjunction with the celebration of the10-year partnership between Sunway TES and ICAEW. The scholarships are open for those with eight papers Credit for Prior Learning (CPL) from ICAEW in Universiti Sains Malaysia (USM), International Islamic University Malaysia (IIUM), Universiti Malaya (UM) and Universiti Teknologi Malaysia (UTM). Each university is allocated 10 scholarships, students will receive a scholarship worth RM29,980 each for a three year study. 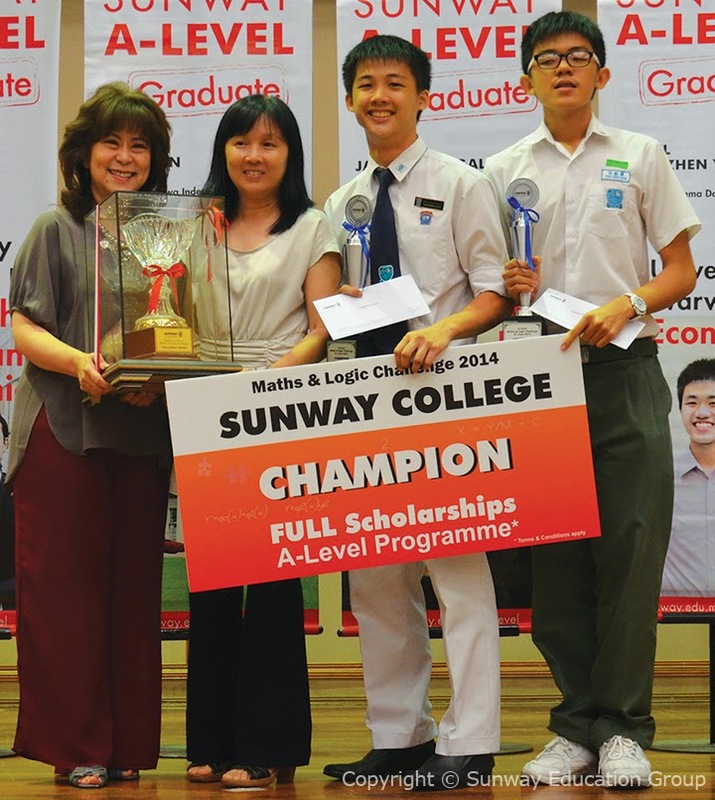 In an intriguing competition which tested participants’ ability to think mathematically and laterally, Sunway College hopes to be a catalyst in helping to promote excellence in mathematics amongst secondary school students. “Mathematics is known to be a fundamental part of human thoughts and logic, and integral to attempts at understanding the world and ourselves. Mathematics provides an effective way of building mental discipline and encourages logical reasoning and clear thinking. It is important and interesting in itself, that it also plays a crucial role in understanding the contents of other school subjects such as science, social studies, and even music and art”, said Elizabeth Lee, Senior Executive Director of Sunway Education Group. Elizabeth Lee (left) presenting the award to the champions Ng Tze Donn (2nd from right)& Teh Zee Hoe (far right) with their teacher. 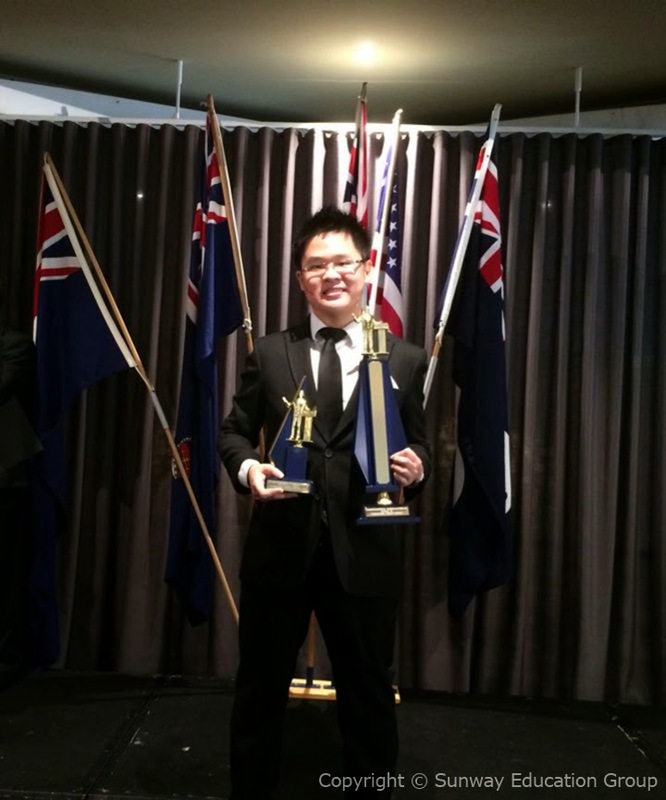 Aaron Ng Ji Yeon, former Sunway’s A level student pitted against seven native speakers from across Victoria, Australia and won first place at the 2014 District 73 International Speech Contest, organised by Toastmasters International in Melbourne. Aaron is a Business Commerce student in Monash University Caufield. He transferred from Monash University Malaysia in 2013. Prior to that, Aaron did his A levels at Sunway College Kuala Lumpur. Pre-university studies and Sunway International School students recently attended a Maths workshop by Charlie Gilderdale, NRICH Project Secondary Coordinator and Senior Research Associate of the University of Cambridge. In the Convincing Yourself, Convincing Others workshop, students had hands-on learning with mathematics and patterns. They were taught to notice patterns, ways to determine the logic of the pattern and enhance the quality of their arguments on problem solving. The workshop exposed students to visual and written forms of expressions. They learned to connect language and mathematics, developing skills for clear, strategic, critical and creative thinking. 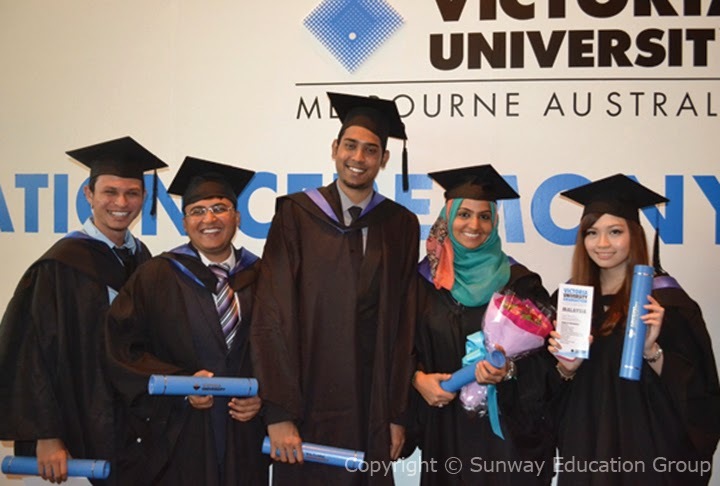 The Malaysia Graduation Ceremony for Victoria University 2014 held at the Grand Ballroom, Sunway Resort Hotel and Spa was a time of jubilation and rejoicing for the more than 300 graduands hailing mainly from Malaysia, Singapore, Hong Kong and Vietnam. By the time they were seated together with their parents, friends and faculty members, Teresa Tjia, the Registrar had already given them a very detailed and warm briefing on what they should do when they went up the stage to receive their scrolls. The matter of how they were to doff their caps was carefully demonstrated, with the reminder that the tassle should always be on the left. Seemingly small, these were significant observances to dignify the occasion. The VIPs for the ceremony included the Chancellor, George Pappas; Vice-Chancellor and President, Professor Peter Dawkins; Deputy Vice-Chancellor, Professor Duncan Bentley; Academic Registrar and Executive Director, Student Services, Teresa Tjia; Director of Learning and Teaching, Professor Terence Hallahan; Senior Executive Director Sunway Education Group, Elizabeth Lee; Tan Sri Jeffrey Cheah Distinguished Professor, Professor Jarlath Ronayne; Head of Australian University Programme, Ms Greeja Hemalata De Silva; Head of Victoria University MBA Programme, Dr Hendry Ng Han Swee; Principal, Sunway College Johor, Hor Poh Choo; and Head, Degree Programmes, Sunway College Johor, Ong Mei Mei. “Buy, Eat, Bus” is a return tray campaign (RTC) organised by students and staff of Sunway’s Department of Communication and Liberal Arts together with Sunway’s Health and Safety Department. 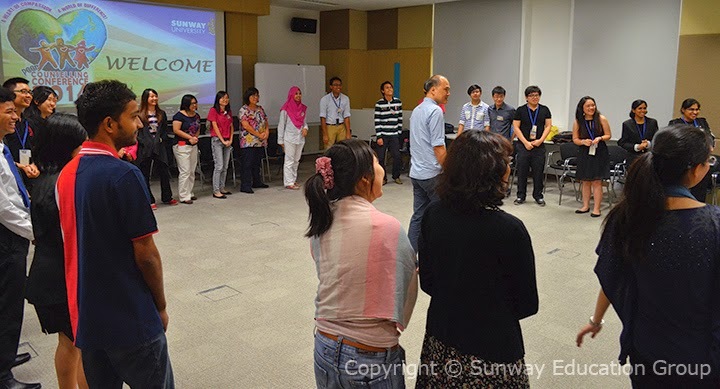 The Sunway Student Services Department, in collaboration with the Sunway Peer Counselling Volunteers (PCV) and the Sunway University Psychology Club, recently organised the Peer Counselling Conference 2014. The 2-day conference was held at the Sunway University Graduate Centre and attended by 170 students from local and private universities from across Malaysia. Demonstrating an excellent knowledge of history and science, a team of young students from Sunway College emerged as the champion in the Big History inter-campus quiz challenge, beating 18 other teams from local colleges and universities. Organised by Astro’s History Channel, the competition was held at Petrosains, Kuala Lumpur Convention Centre and officiated by Deputy Education Minister I Datuk Mary Yap. 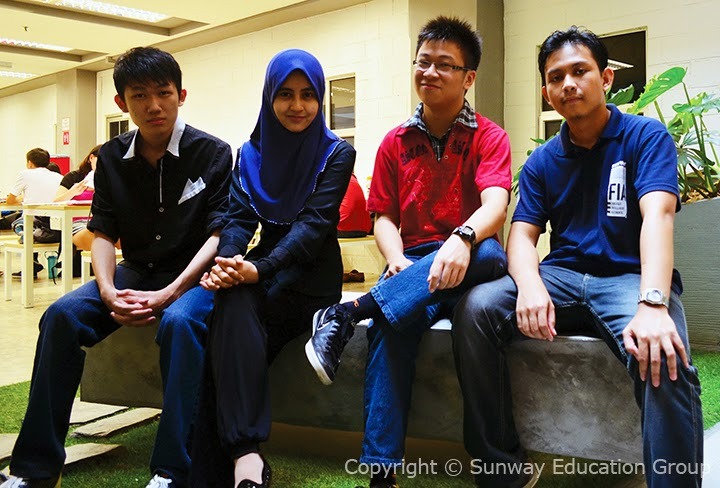 Sunway team, named Team Sunway Professional 4 comprised of four college students from the Foundation in Arts (FIA) – team leader Yim Soon Keat, Avery Choke Kar Sing, Muhd. Hazim bin Dahuli and Ria Heryani Binti Mumfahir. As the champion, the team member each received a certificate, a Kindle Fire, an Apple TV and an MPH voucher worth of RM50. “Plastic didn’t decide to kill itself, to jump into the river and cause pollution. We are the ones who decide there’s the trash bin and there’s the river. So why blame plastic for pollution when we are the ones who decide to throw our trash into the river and not into the rubbish bin”, this was one of the points made by seventeen year old Ethan Ganes who emerged as Champion in the Public Speaking & Essay Writing Competition 2014. The competition organised by Sunway College together with the Oxford and Cambridge Society of Malaysia saw a crowd of 792 fourth and fifth formers, led by 88 teachers from 49 schools, as far away as Ipoh, Seremban and Melaka attending the event. While their fellow friends attended the talks held within the Sunway campus, 90 students participated in the public speaking competition and 88 in the essay writing competition. Donating daily necessities is one of the most effective ways of supporting those in need. The Sunway Student Volunteers (SSV) successfully raised RM3,600 worth of food items and RM1,150 cash to be donated to the entities under the umbrella of Grace Community Services (GCS). The project, aptly called “Turn Groceries in for Foodbank” (TGIF Foodbank), was initiated by SSV and Sunway Student Services Department (SSD) in partnership with GCS, a registered non-profit charitable organisation in Klang for charitable homes, rehabilitation centres, feeding centres, rural schools, poor families and individuals. 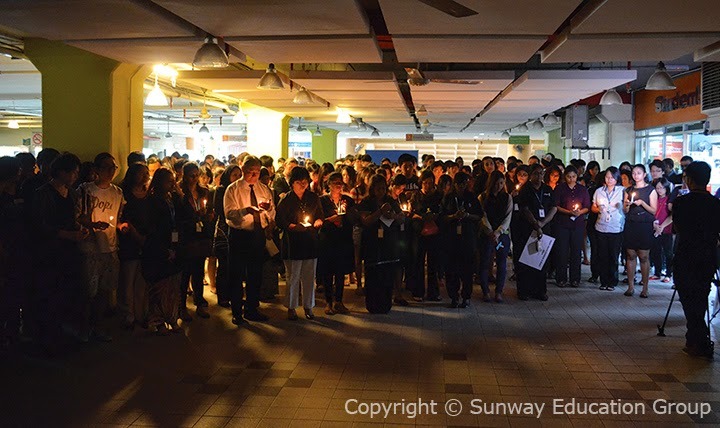 Non-essential lights were switched off as Sunway celebrated Earth Hour on 29 March 2014 between 8:30 and 9:30pm. Students and staffs also joined in the worldwide movement by signing and pledging to "Live Green". Two hundred and twenty five students received special pre-university scholarships for studies in five pre-university programmes at Sunway recently in an award ceremony, celebrating some of the best and brightest youths from all over the country. The pre-university scholarships, amounting close to RM2 million will enable these students to pursue studies in the Australian Matriculation Programme (AUSMAT), Cambridge A-Levels, Canadian International Matriculation Programme (CIMP), Monash University Foundation Year (MUFY) and the Sunway Foundation in Arts. These special scholarships were given out based not only on students’ academic results but also through their active participation in extra-curricular activities. Ms Elizabeth Lee, Senior Executive Director of Sunway Education Group said in her speech, “Apart from your intellectual capabilities, it is important to note that we see in you the potential to move on to better and brighter achievements”. The recipients from all over Malaysia were shortlisted from a total of one thousand six hundred and eleven applications. It was a rainy and hazy morning on 4th March 2014. 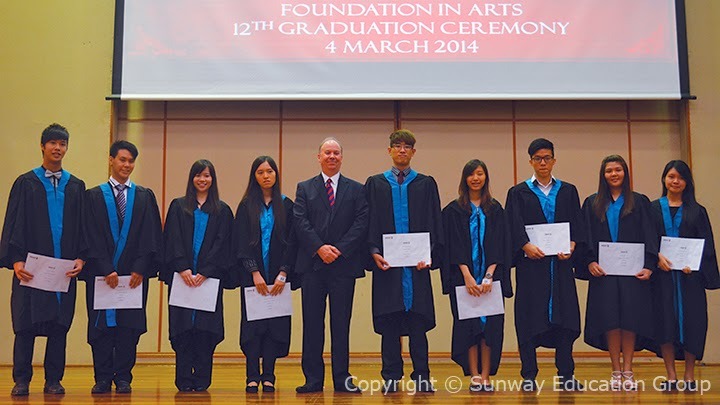 Yet it did not dampen the spirits of the graduates of Sunway College Foundation in Arts (FIA) programme who joyfully celebrated their year-long hard work. Cheng Mien Wee, Executive Director of Sunway International School and Director of Pre-University Studies in her welcome address said, “To the parents and guardians, thank you for choosing the FIA programme at Sunway and for entrusting your children with us, we hope that we have enriched them in their studies.” Sharing the achievements of previous graduates, “Last year we saw the graduation of the first batch of our FIA students”, she continued, “8 out of 15 first class honours recipients at Sunway University and Lancaster University were former FIA students”. Poised to lead Asia Pacific in professional accountancy training. Malaysia’s leading accounting school, Sunway TES Centre for Accountancy Excellence today launched its own home-grown Diploma and Advanced Diploma in Professional Accounting programmes as its unique value propositions befitting its status as the Centre for Accountancy Excellence (CAE) appointed by the Government last year. The launch was officiated by Y.B. Datuk Mary Yap, Deputy Education Minister 1, Malaysia. In her speech, Datuk Yap said the programmes will give students the flexibility in their paths in professional accounting, allowing them to a fast track accountancy degree or professional qualification such as ACCA and ICAEW ACA. This indirectly will position Sunway TES Centre for Accountancy Excellence as taking the lead in Asia Pacific region to promote excellence in accountancy training. 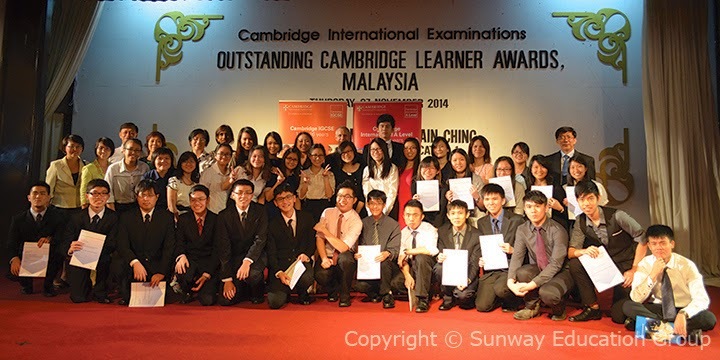 In the November 2013 Cambridge A-Level examinations, Sunway students obtained a pass rate of 100% with 57% scoring straight As, the best ever results for the examinations since 1994. 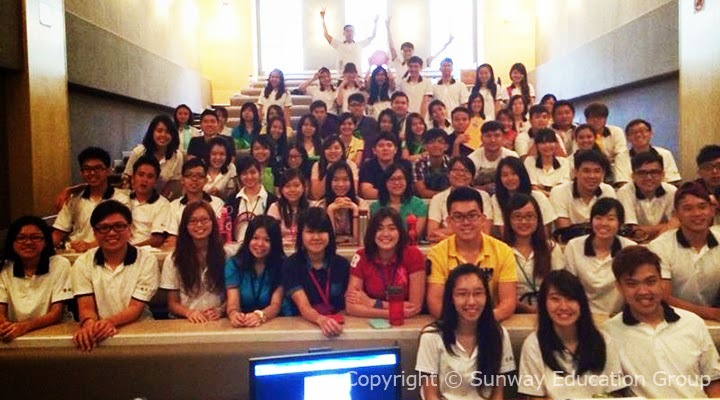 A celebratory tea gathering was hosted by Sunway College for the students before they begin their university studies. Among those present was Ng Wai Tuck, the proud and happy father of Ng Jie Yi, who scored 4 A*s in Physics, Chemistry, Biology and Mathematics. Jie Yi has been offered a place in University of Cambridge to study Veterinary Medicine. Quiet and reserved, the twenty year old who loves books by J.R.R. Tolkien, will only start in Cambridge at the end of the year. 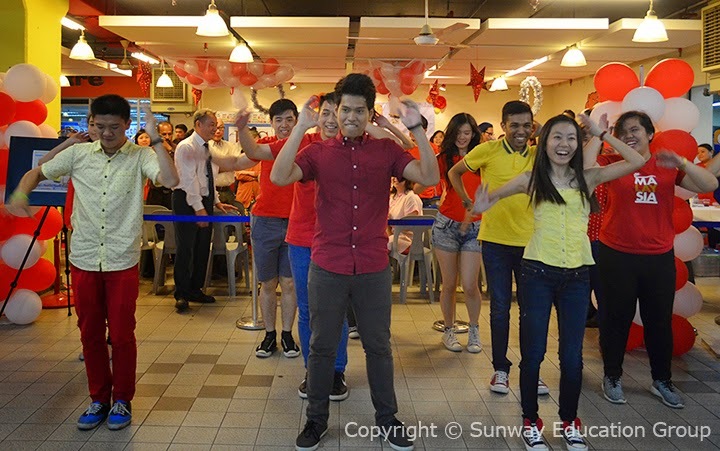 “Studying A-Levels at Sunway College has been a great learning and growing experience for me. I am incredibly honoured and grateful to be taught by such experienced and dedicated lecturers who provided so much help and support”, said Jie Yi. On Monday, a short candlelight vigil was held where the crowd observed a 5-minute silent prayer for the families and all those on-board the missing air craft. 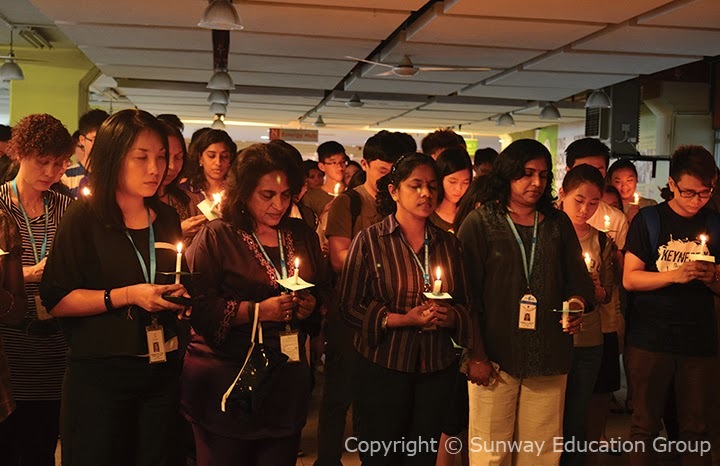 The short vigil, was initiated by Jennifer Rathabai Kunchiram, President of Sunway Academic Staff Association with the support of administration and academic staff, students and the management of Sunway Education Group. 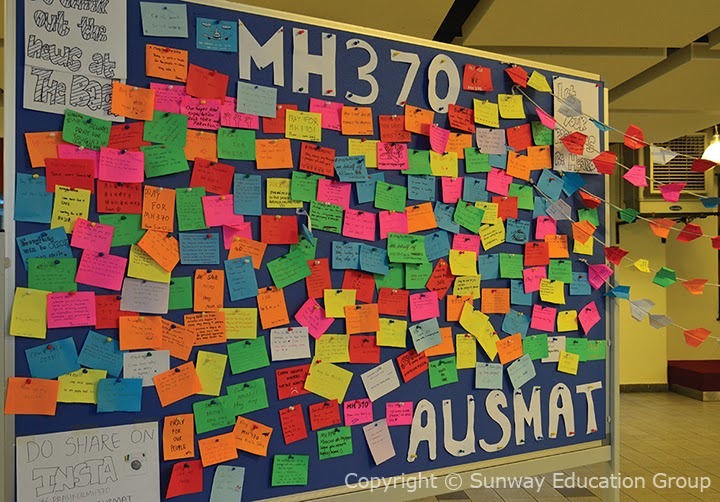 Sunway’s Australian Matriculation (AUSMAT) Student Council, set up notice boards for all those who wish to share their prayers and messages. 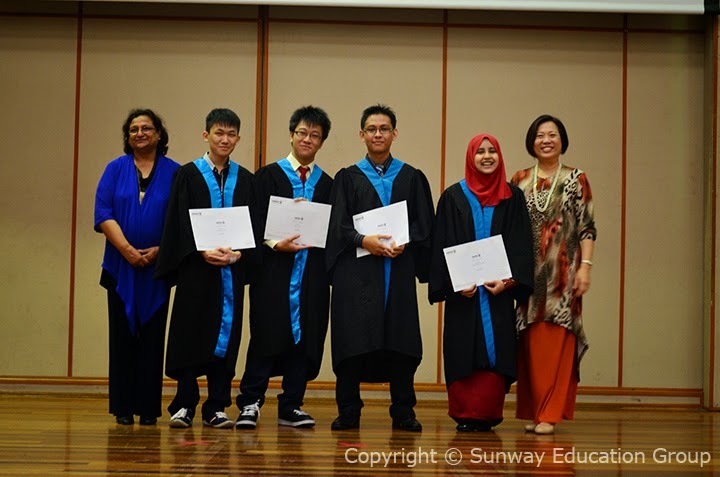 Sunway AUSMAT students are UNDENIABLY Top in Malaysia and the WORLD! At the recent AUSMAT Achievement & Appreciation Awards, Sunway AUSMAT students celebrated their remarkable achievements in last year’s WACE examinations. Top student and President of Student Council for AUSMAT 2013, Gavin Gan Yew Meng received the Special Course Award for English as Additional Language & Dialect (EALD). This top world is awarded to Gavin for obtaining the highest mark in EALD worldwide. Gavin was also a recipient of the Special Certificate of Distinction along with Vivian Tan Ai Wen for Accounting & Finance and Oliver Leonard Jalleh for Business Management & Enterprise. This Certificate of Distinction is awarded to students who are in the top 0.5 per cent of candidates in a WACE subject in the 2013 WACE exam worldwide. Four students, Lee Wen Hui, Bryan Poh Chen Shen, Preeya Kaur Dhaliwal and Gerald Tan Chen Jie who achieved above ATAR 99 and above were presented with the Achievement Award for WACE Top 1%, while their course-mates who achieved ATAR 95 and above received the Achievement Award for WACE Top 5%. 60% of AUSMAT students achieved ATAR 80 and above with 99% qualifying for university education worldwide. 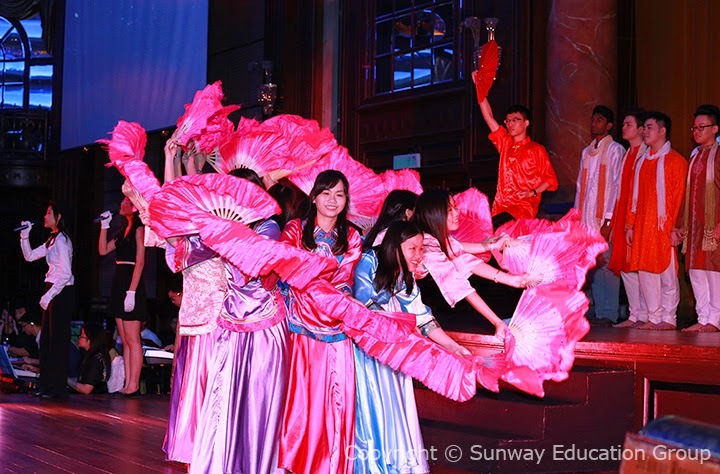 AUSMAT at Sunway is more than just learning in the classroom. Students get hands-on experience through out of class activities where they learn team work, interpersonal and leadership skills which help make AUSMAT a truly memorable experience. The programme is unique in the way that it focuses on the holistic development of students by addressing individual learning needs, personal growth and uses a multiple approach to problem solving and critical thinking. The broad learning pedagogies of AUSMAT prepare students for university level studies and enable them to apply skills into other disciplines and specializations. Sunway is the largest and longest running provider of AUSMAT (Australian Year 12) in Malaysia. The strong partnership of Sunway College and, the School Curriculum and Standards Authority (SCSA) is committed to uphold the standards of the programme to that ensure quality assurance and teaching consistent to that of Western Australian Schools. 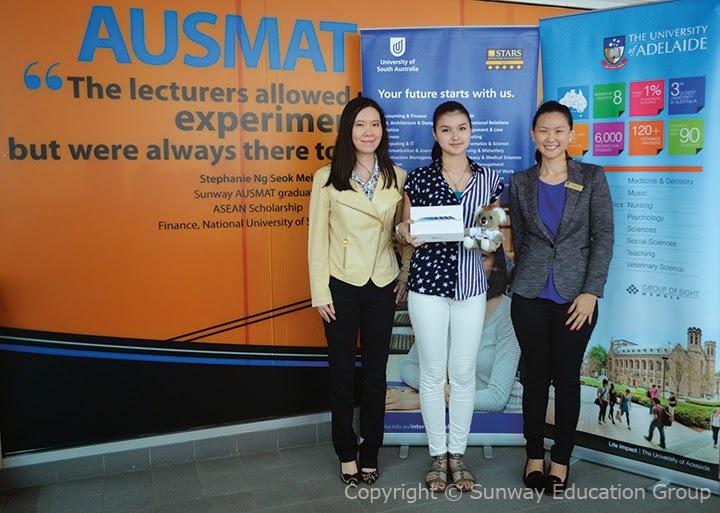 The Australian Matriculation (AUSMAT) at Sunway is an internationally recognised pre-university programme. This programme prepares students for the Western Australian Certificate of Education (WACE) and is widely accepted by universities in Australia, New Zealand, United Kingdom, USA, Canada, Russia, Germany, Singapore and also private universities and university colleges in Malaysia. 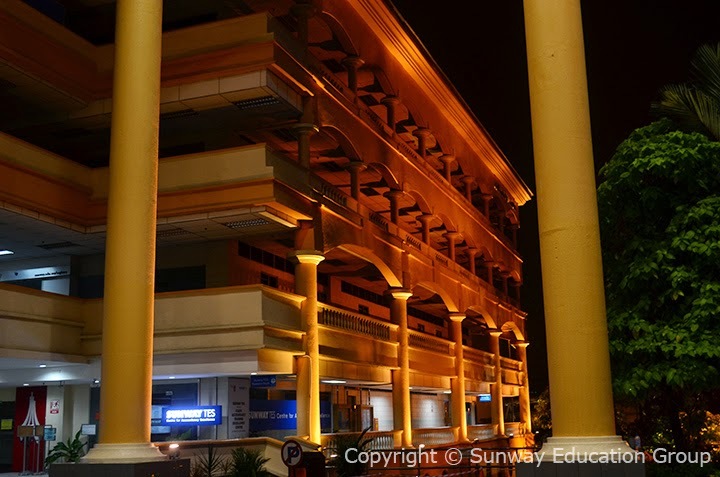 The AUSMAT programme at Sunway College offers a flexible combination of diverse subjects which include Biological Sciences, Chemistry, Physics, Psychology, Mathematics, Economics, Accounting and Finance, and Business Management. The programme does not restrict students to any specialisation or subject combination. Depending on their personal interests, students can choose and combine a variety of subjects for their studies allowing them to develop their best potentials.